Against the Wall Has Been Greenlit! It's official! As of the 28th of August, my game was Greenlit on Valve's game distribution service. Thank you to everyone who up-voted Against the Wall and making this possible. I received this news directly before my 29th birthday and shipping off to PAX on a red-eye to Seattle. It's been pretty hectic, but I finally found some time to post here. I've been on Greenlight for a total of 9 months. In December and January, I went through the 5 stages of grief before just letting it climb the ranks naturally and not checking the Greenlight page every other hour. It was not the best experience, but the game had enough merit to pull through. I just got back from PAX Prime. I had a mini booth at the Indie MEGABOOTH for Friday and Saturday. The mini booth is a table inside of a larger game booth, a space that I shared with 15 other developers. I had a blast showing my game to dozens of attendees, though there was a hitch on Friday: the tables were arranged in a way where it was very difficult for people to reach the games in the center, including mine. This was corrected on the second day, however, and I managed to have a number of cool play-throughs. I should mention that PAX is the ideal QA forum. People from all different backgrounds stopped by to play Against the Wall for the first time, and it was enlightening to see them learn how to control the character and move through the world. Also, they managed to break the game in ways I had not thought possible. It was extremely informative, to say the least. 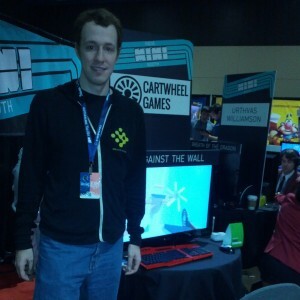 Oh, and I gave my pitch of the game several hundred times, at the booth, on the show floor, and at the after-parties. The shortest way to pigeon-hole my game is to call it a cross between MYST and Portal 2, but set on an infinite open wall-world. I should probably do a longer post on my current design which leans more on MYST tropes, a focus on world-building and atmosphere with interrelated levels. In other news: I shook hands with Jonathan Blow and Tim Schafer without acting like a total fan-boy. Also, as I am writing this, I am getting the feeling that I may be sick very soon, perhaps with the dreaded PAX Pox. Just in time for the Fall semester which starts tomorrow. I met the team behind the Oculus Rift at one of the PAX after-parties. The Oculus guys were very cool and down-to-earth, recalling their days with headsets held together by duct tape and wishes, and their Kickstarter experiences. During the show, I snuck in a session with the HD rift. The operator seemed disappointed that this was not my first rift experience, the usual response being one of awe, while mine was one of clinical product testing. 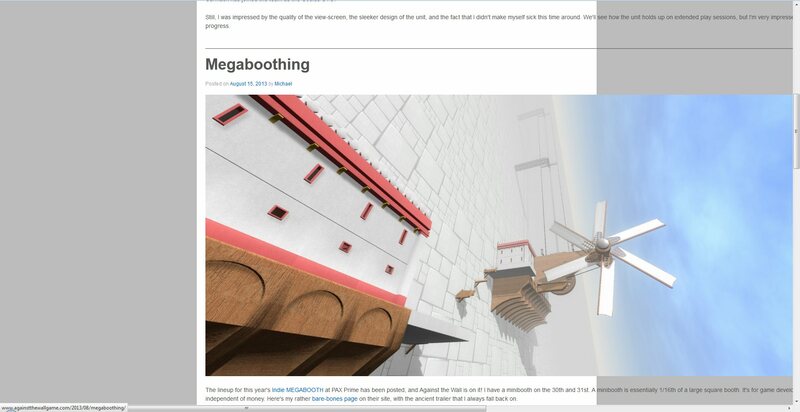 I kept swaying and swishing my head from side to side, observing the problematic motion-blur effect that induces some level of sickness in users. The blur is still there, but at least you can't see the damn pixels anymore, which was half the problem. I'm sure they'll fix this, now that John Carmack has joined the team as the Oculus CTO. Still, I was impressed by the quality of the view-screen, the sleeker design of the unit, and the fact that I didn't make myself sick this time around. We'll see how the unit holds up on extended play sessions, but I'm very impressed with their progress. Yeah, that wasn't broken in Firefox, careless error. Fixed now. Thanks for telling me! Nice to see things are trucking along for ya Michael, and congrats on getting the game greenlit. Congratulations! ^_^ I look forward to playing the finished product!